I often brew homemade beer. It’s an enjoyable hobby that allows me to sometimes use items from my garden and gets me deeply in touch with the natural process of making a homecrafted beer. I have complete control over the ingredients and can make whatever variation seems good to me with whatever ingredients seem flavorful to me. Plus, it makes a really cool gift for someone who appreciates a good homecrafted beer. 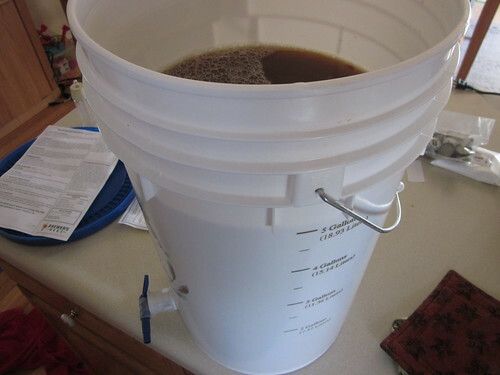 What follows is my procedure for making a simple homemade beer. I chose to base this batch on a kit, because kit brewing is without a doubt the easiest way for a newcomer to try out homebrewing. 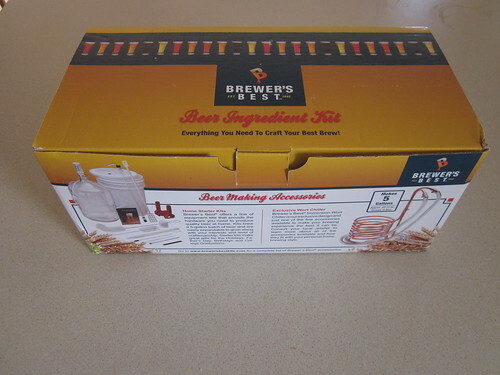 A homebrew beer kit, like the one pictured above, can be purchased at your local homebrewer’s shop. Most cities with a population of 50,000 or more have one – the larger the city, the more likely it is that there will be multiple shops. Search around for them, visit a few shops, identify a beer kit you’d like to try, and don’t be afraid to shop around. For this year’s Christmas beer, I chose to make a lighter beer with hints of coriander and orange. The kit came with a small amount of each – I chose to add a few coriander seeds on my own. A homebrew beer kit contains all of the liquid and solid ingredients you need for beermaking besides the water, the glass bottles, a pot to boil the beer in as you’re making it, and another container for the beer to ferment in. You’ll also need a small handheld device for putting the caps on the bottles. 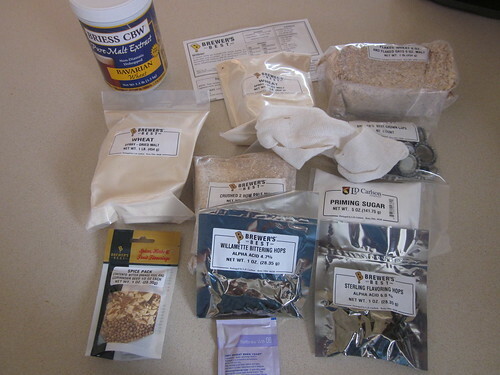 … I recommend picking up a simple homebrewing equipment kit at that shop as well, especially if you’re thinking about brewing your own beer regularly. 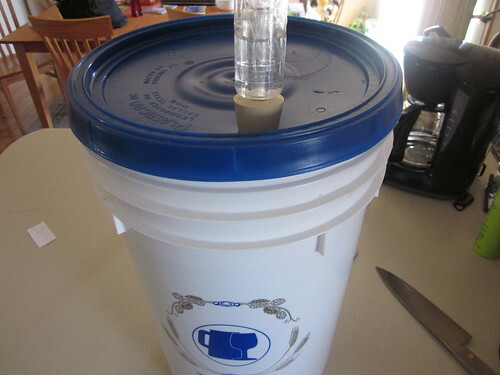 A kit usually includes a large bucket with a spigot near the bottom (with a tight-sealing lid that has a breathe hole), a small bubbler that allows gas to escape the bucket without exposing the beer to air as it is fermenting, a capping tool, and usually a piece of rubber hose to make the bottling easier. We brew beer fairly often (a few batches a year), so we usually use a five gallon glass bottle for most of our fermenting needs. For beginners, it doesn’t make a big difference, but a glass bottle allows less gas to escape through the sides of the container. The first thing to do is to sterilize everything you’re going to use to the best of your ability. We use an iodine-based solution for this cleaning – you can use bleach or whatever you choose. The “tea bag” is simply a cheesecloth bag (usually included in the kit) that is wrapped around the dry grains used in beer making – wheat, oats, and various other things depending on the type of beer you’re making. All you do is put those grains in the cheesecloth bag, tie the top, and put it in the boiling water for an hour or so (depending, again, on the specific grains – don’t worry, kits include an instruction sheet). You’ll usually end up with cloudy water. Once the “tea bag” is finished, you start adding other ingredients – liquid malt (shown above), dried malt powder, hops, coriander, and orange peel all go into the pot. 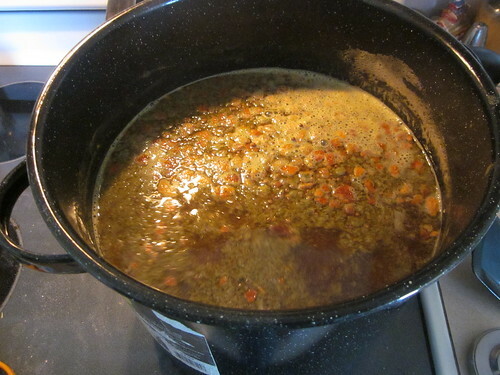 This is stirred regularly and boiled for about fifty minutes. Once the boiling is finished, you need to cool the hot beer rapidly. I do this by preparing an ice bath in my kitchen sink. I simply fill one of the basins with cold water, add a bunch of ice to it, and stick the whole boiling pot straight in there. The ice water on the outside of the container helps to cool down the beer rapidly (and rapid stirring helps, too). 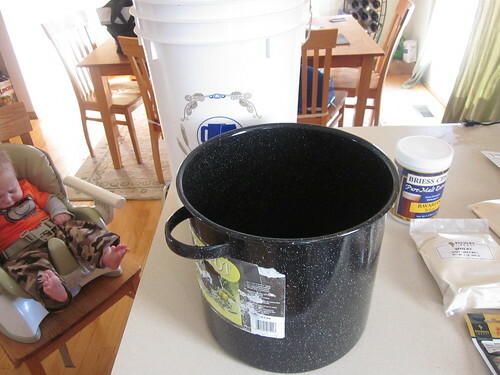 Once the beer is down to about 80 F or so (35 C), just pour the contents of the pot straight into your fermenting bucket (make sure the spigot at the bottom is closed!). Add room temperature water until the bucket is full to the five gallon mark, then sprinkle some yeast on the surface and stir the yeast into the beer. Once that’s done, put the lid on the bucket, put the bubbler on the lid, make sure there’s a bit of water in the bubbler, and wait. After about 12 hours, you’ll start to see rapid bubbling in the bubbler. 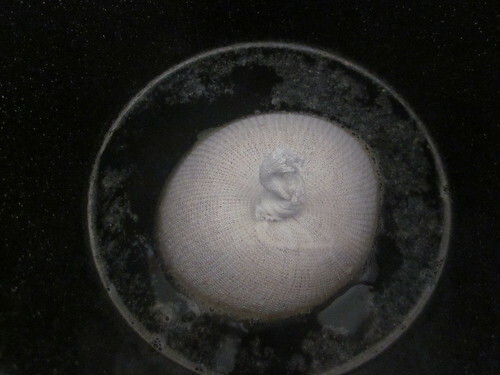 This will go on for a couple days, then slow down gradually until it appears not to be bubbling. You want the fermentation to stop before you add it to the bottles. The way I do it is that I wait until it appears not to be bubbling any more. I then watch the bubbler for three minutes. If I see a bubble, I wait one more day and watch again. 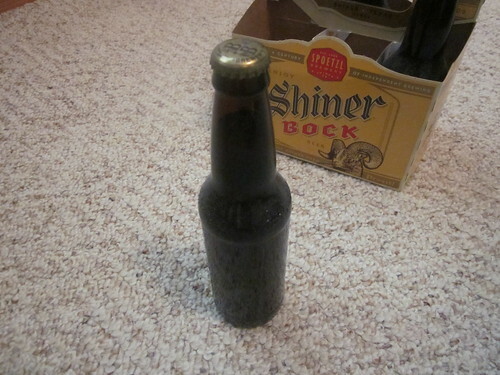 If I don’t see a bubble, I mark the calendar and bottle the beer three days later. Bottling is also easy. Make sure the bottles are as clean as you possibly can (you’ll need roughly 50 bottles). As mentioned above, use bleach or an iodine solution and rinse the bottles thoroughly. 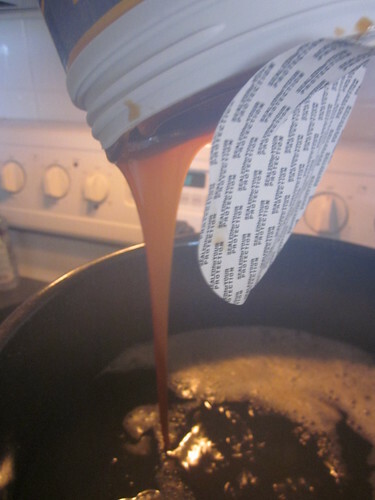 Next, mix the priming sugar with two cups of boiling water and boil the mix for a few minutes. This provides food for the remaining yeast to add carbonation to the beer – that wonderful bubbliness. Cool the priming sugar mix, then add it to the bucket and stir for a couple of minutes. Then, simply fill up each bottle with the spigot. Go slowly and carefully – use the plastic tubing and pinch the tube to control the flow. You’ll want to leave an inch or so of air in the neck of the bottle. Put a cap on the top with the capper (in your kit) and you’ve got yourself a bottle of beer! Our coriander-orange beer is currently still fermenting, so the completed bottle pictures are of our previous batch, a hefeweizen. 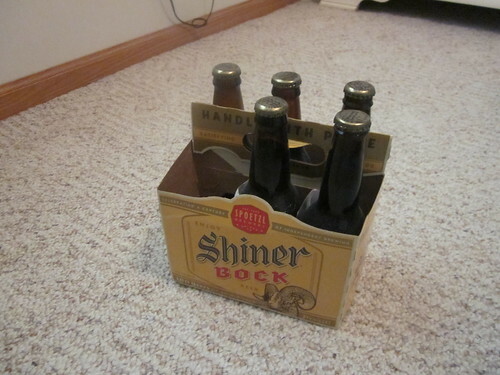 For our own homebrew, we just reuse six pack boxes of other kinds of beer (in this case, Shiner Bock). We label the caps with a number to identify which beer is which. For our finished gift bottles, we’re planning on making custom labels of our own design. The initial equipment can cost $20 to $30, depending on availability in your area. Each kit costs about $25 and makes roughly eight six packs of bottled beer. Thus, if you’re just making one batch, it can be pricy, but if you’re going to make several, the initial equipment is prorated across all of your batches and the price becomes very reasonable, especially given the high quality of the beer you’re making. I’m very serious about the quality of homebrewed beer. The three best beers I’ve ever had in my life were brewed in my own home. The freshness of the ingredients and the control you have over those ingredients allows you to make some incredibly good beer at a great price. Even better, it makes a great gift.